Shure recently announced new additions to their popular GLX-D Digital Wireless line at the 2017 Winter NAMM Show in Anaheim. Shure’s new GLX-D Advanced Digital Wireless represents an enhanced suite of products, which includes the GLX-D Advanced Frequency Manager, rack mount receiver system, remote antennas, and accessories. Recommended for a broad range of installation environments from houses of worship, educational institutions and auditoriums to event venues with multiple wireless system requirements, GLX-D Advanced Digital Wireless products provide users high quality sound along with the easiest multi-system wireless experience. GLX-D Advanced users gain from notable GLX-D features, including exceptional digital audio, automatic frequency management, and intelligent rechargeable batteries. Using the new Frequency Manager, GLX-D Advanced users can seamlessly and confidently operate up to nine simultaneous systems in typical conditions, and 11 channels in optimal conditions. 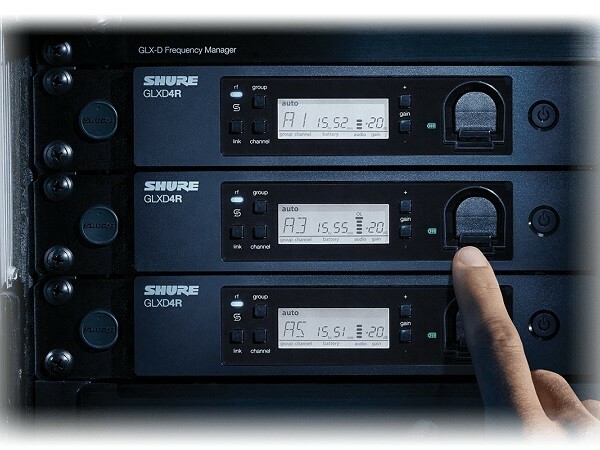 Key features of Shure’s GLX-D Advanced Digital Wireless range include new rack-mountable configuration allowing up to six GLXD4R receivers to be linked to a GLX-D Advanced Frequency Manager via the RF ports; Frequency Manager automatically assigning optimal frequencies to all six receivers utilising patented data communication via the existing RF cables to simplify installation; and additional rack mount systems facilitated by linking two Frequency Managers together. According to Mike Nagel, Wireless Product Manager at Shure, GLX-D Advanced saves time and money for both installers and users by including rack hardware and rechargeability in the box. Shure products are available in Australia from Jands, a leading Australian distributor of sound, lighting and staging solutions.